My birthday was on July 15th, and this year all I asked for was books, and I got them! This is really late to be posted because not only did I get books, I also got money, which of course I spent on books. 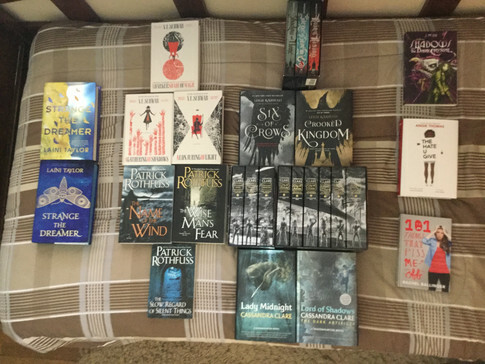 I got single copies and box sets, but in total, I got 33 books! Some of them were preorders so I do not have them know obviously, but still, 33 books! That's so many! Here's a picture of all of them, taking up almost all the space on my bed. Anyway, let's break this down. -The Infernal Devices Trilogy by Cassandra Clare, which includes Clockwork Angel, Clockwork Prince, and Clockwork Princess. -The Mortal Instruments Series by Cassandra Clare, which includes City of Bones, City of Ashes, City of Glass, City of Fallen Angels, City of Lost Souls, and City of Heavenly Fire. -A preorder for A Court of Thorns and Roses box set by Sarah J. Maas, which includes A Court of Thorns and Roses, A Court of Mist and Fury, and A Court of Wings and Ruin. -Turtles All the Way Down by John Green. -Adultolescence by Gabbie Hanna (A.K.A. The Gabbie Show). -The Shades of Magic Series by V.E. Schwab which consists of A Darker Shade of Magic, A Gathering of Shadows, and A Conjuring of Light. - What is out of the Kingkiller Chronicle by Patrick Rothfuss which consists of The Name of the Wind, The Wise Man's Fear, and The Slow Regard of Silent Things. -The Six of Crows Duology by Leigh Bargudo, which is Six of Crows and Crooked Kingdom. -What is out of the Dark Artifices Series by Cassandra Clare, which is Lady Midnight and Lord of Shadows. -Shadows of the Dark Crystal by J.M. Lee. -The Hate U Give by Angie Thomas. -101 Things that Piss Me Off by Rachel Ballinger. -Stranger the Dreamer by Laini Taylor, both the U.S. edition and the U.K. edition because they're too pretty and too good not to have both copies. So there you have it, my ridiculously large birthday book-haul of 33 books! I'm so overwhelmed now, I don't know what to read next, but I'll figure it out soon enough.